A fully revised and redesigned book for students at upper-intermediate level who wish to practise and improve their reading skills. Reading Techniques is for students at upper-intermediare level who wish to improve their general reading skills in English and/or to work towards international examinations at B2 level (common European Framework).The emphasis in Reading Techniques is on learning practical techniques to enable students to become effective readers, and to tackle reading papers in examinations with confidence. It can be used to supplement any coursebook at this level and is suitable for classroom use, for homework or for self-study. 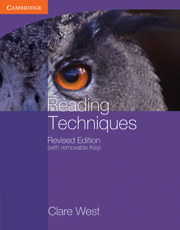 Coverage of the main reading skills required at this level - skimming, scanning, intensive reading, reading between the lines, speed reading and identifying topic, source and register. Graded practice in three common task types - multiple choise, gapped texts and multiple matching. Study boses with clear step-by-step guidance and regular reminders of the skills required, including icons to aid visual intelligence. Texts from a wide range of sources, in varying styles and registers. Four full-length Practice Tests suitable for students preparing for FCE Paper 1.